Word Regenerator is a brand new recovery solution for lost Microsoft Word documents. Indispensable tool for recovery of damaged, deleted or overwritten Word files from an existing partition as well as of lost documents from formatted, corrupted, or deleted partitions. A corruption implies data losses. Many other document recovery programs recover corrupted documents from a single file. 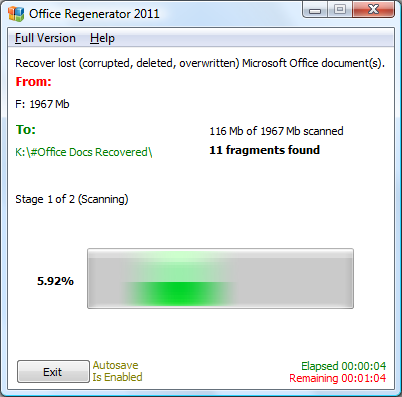 The result of such recovery is a document with probable data losses. In contrast to other recovery software, Word Regenerator regenerates Microsoft Word documents not from a single file, but from the entire disk and without any losses of data. Word Regenerator allows recovering Microsoft Word files even in the most desperate situations. It supports all versions of FAT and NTFS and regenerates documents even from lost, deleted partitions and reformatted disks. If you need more information please contact the developers of Word Regenerator (Abstradrome), or check out their product website.